The first rule in selecting a pipe is to purchase the best possible pipe you can afford. The ultimate price of all pipes is determined by briar quality, stem quality, and the quality of workmanship. The quality of briar is determined by a number of factors including aging, grain texture and the lack of imperfections. This quality determines how smoothly your new pipe will break-in, how dry and mellow your pipe will smoke and how resistant to souring-out your pipe will be during its life. While flawless pipes are treasured, they are both rare and expensive. You need not purchase a perfect flawless pipe. Small surface imperfections do not affect smoking quality. A name brand upon which a manufacturer's reputation rests is, perhaps, the best guarantee of quality. Such brand-named pipes come in a range of prices which allow a broad range of selection. Pipes come in many colors, textures, shapes and sizes and most pipe smokers will collect a variety of them. For that first pipe, we suggest a pipe of medium size that is light in weight and reasonably straight. We recommend the Savinelli Dry System which we have found to have more than twice the retention rate among new pipe smokers than most other pipes. With its Balsa insert that absorbs 10-12 times its weight in moisture, its lip that deflects smoke away from the tongue, and its moisture reservoir, the dry system is the most forgiving and abuse-resistant, moderately priced pipe on the market today. Choose your pipe with care; it should suit your personality and enhance your appearance. Most important is that it feels comfortable in your hand as well as in your mouth. Briar, the most suitable and prominent of pipe materials, is unsurpassed in its resistance to burning out, its low heat conductivity, porosity, and it strength-to-weight ratio making it best suited for pipe smoking. Briar is the root burl of the White Heath shrub that grows primarily in the arid climate and rocky/sandy terrain surrounding the Mediterranean Sea. Every year harvesters climb into the mountains looking for treasured burls of briar. The briar burl is the bulbous growth that lies just below the surface and connects the stalk to the root system of the Heath shrub and serves as the moisture reservoir for the long, dry seasons. It is the Heath shrub's struggle for survival that gives briar the characteristics so important in pipe making-a hard, dense graining. Given the increased popularity of pipe smoking and the fact that it takes from 25 to 250 years for a burl suitable for pipe making to develop, quality briar is becoming more difficult to come by. Because briar is organic, there is much waste due to fissures etc. Only about 30% of burls are suitable for harvesting and only about 3% to 7% of harvested briar ends up as a finished pipe. The harvester takes the burls to a sawmill where they are cut into small blocks suitable for making pipes. They are then boiled from 12 to 24 hours to remove sap and resins. 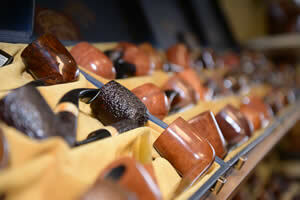 They are then graded into major quality categories and offered for sale to pipemakers. A high quality plateau destined to be made into a fine handmade pipe can cost 30 to 40 times as much as an inferior product likely to find its way into a "drugstore" pipe. Meerschaum is a mineral (hydrous silicate of magnesium) of organic origin. The pure white block, Meerschaum, is found only in a four square mile area in Central Turkey near the village of Eskishehir and is excavated at depths ranging from 200 to 300 feet. The harvested blocks are cleaned and then hand carved into pipes. Meerschaum, because of its porosity, provides a luxurious dry smoke and will color to a deep golden amber over the years. Although fragile and generally considered an "armchair" pipe, no collection is complete without its crowning Meerschaums.